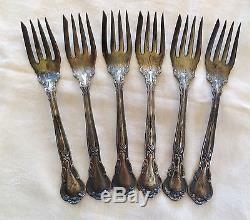 Lot of assorted Antique Sterling Silver Flatware. All of the pieces are marked with the Gorham Silver hallmark of Lion, Anchor, & the letter G, some are also engraved S. All pieces are engraved the word "Sterling". Most of the pieces are marked Pat. All pieces but one teaspoon are monogramed "MMM" in beautiful script. The following pieces are in this lot. 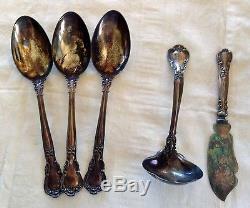 3 - 8-1/4 Serving Spoons - S. Kind & Sons w/Gorham Hallmark - Pat. 1895 - Marked "T" on back, Sterling. 1 - 7 Master Butter Knife - Gorham Hallmark - Sterling. 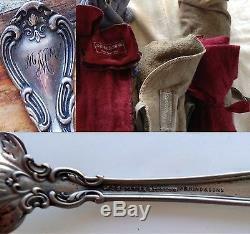 1 - 6-1/2 Gravy Ladle - Gorham Hallmark - S. 1 - Dodd Rodgers Nickel Silver Gravy Boat 3" x 8". 6 - 7-1/2 Forks - S. Kind & Sons, Gorham hallmark, Pat. 1895, Marked "T" on the back. 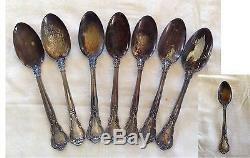 20 - 5-3/4 Teaspoons - S. Kind & Sons, Gorham Hallmark, Sterling Pat. 95, 1 spoon is not monogramed. 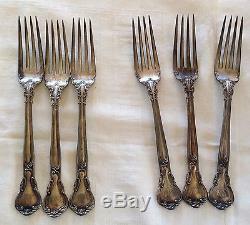 6 - 5-3/4 Salad or Oyster Forks - Gorham Hallmark, Pat. 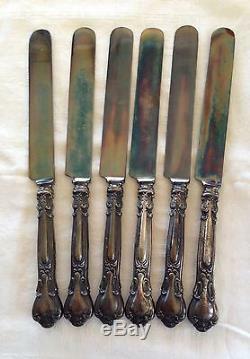 6 - Knives - 9-1/2 - Gorham Hallmark. 6 - 6 Butter Knives - Pat. 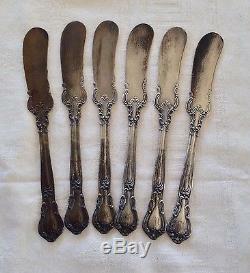 1895 - Gorham Hallmark - S. 1 - 6-3/4 Butter Knife - Gorham5 - Pat. 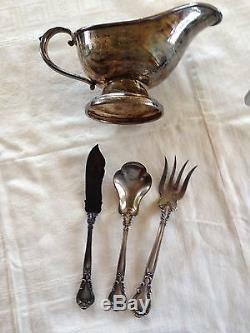 1 - Salad Serving Spoon 6 - Gorham Hallmark, Pat. 1 - Serving Fork - 6-1/2 - Pat. 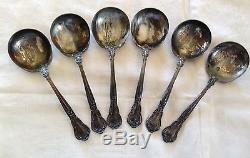 1895 - Sterling - Gorham Hallmark - S. 6 - 5 Soup Spoons - Pat. 95 Sterling - Gorham Hallmark - S. Silver is in good used condition, it needs polishing, shines up very beautifully. The monogram of MMM is different on some of the pieces, the example I show reveals spaces betweenn the M's, but on some pieces, the M's run together, which is just as attractive. We welcome questions and concerns. Thank you for visiting our store. 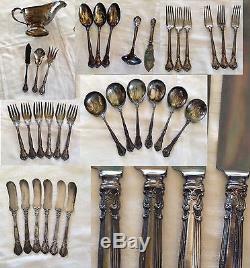 The item "59 Pc Lot Antique Vintage Sterling Silver Flatware Gorham Hallmark S Kind &Sons" is in sale since Monday, March 20, 2017. This item is in the category "Antiques\Silver\Sterling Silver (. antiques" and is located in Lehighton, Pennsylvania. This item can be shipped worldwide.